Attic stock is defined as excess construction material held over to allow for repairs, and utilizing attic stock to get through lead time issues during a construction project is a common practice. 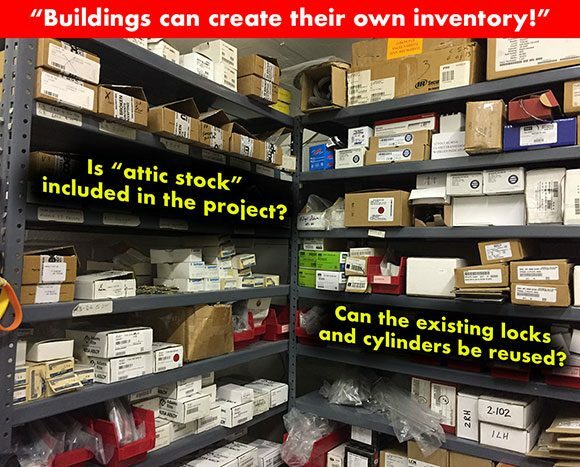 Learn if there is attic stock for the construction project at hand and who will be storing the inventory for future repairs. Even if your team is not storing this material, you may be able to borrow it in an emergency, but you have to know it exist and who has it. Another way of creating inventory is to salvage distinctive locks and cylinders with restricted keyways during the demolition portion of the construction project. Even if the used locks and cylinders are beat up and/or the wrong finish, utilizing them if you are unable to obtain hardware in time for a construction deadline can make the difference between success and failure.